It is December 1st and if you are like me you want to make a memorable holiday season for your kiddos, but you might be overwhelmed with all of the "want to dos" and "must dos" on your list this month. Raise your hand if you are overwhelmed by the sheer number of things running through your head right now that you want to do in December!! If only December lasted all year, right? For the past few years I have been sharing a daily newsletter during December with super simple activities for busy parents/teachers/care givers to try with their kids. Last year I was pregnant with a new baby and I had to get even simpler and scrap the newsletter. This year with four little ones, including a crazy baby that is attempting to walk all over, I am keeping things simple again. 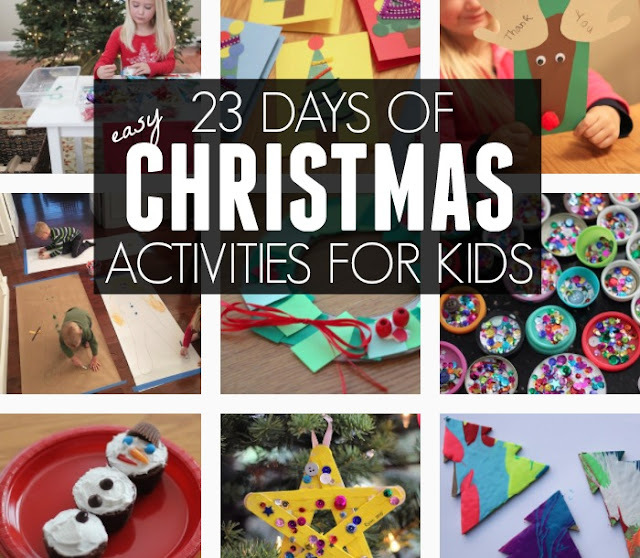 This year I'll be sharing 23 Days of Easy Christmas Activities for Kids over on Instagram. Come join the fun! Crafting, driving around looking at lights, baking, and doing crazy movement games are just a few of the ways we accomplish these goals. We also toss in daily kindness/service activities using our awesome helpers, The Kindness Elves. If you want to have a fun December like we plan to, pop on over to Instagram and follow our 23 Days of Easy Christmas Activities for Kids series. Some of these activities are old favorites that were done in previous years (but are ALWAYS awesome, so we have to repeat them) and several of the activities will be new! Since I have four kiddos (ages 10 months to age 8), we will be doing a variety of activities this year that work for all or most of my kiddos. Sometimes the 10 month old will just be watching while she shakes her jingle bells. I typically try and post the activity for the day early in the day (by like 8am PST)... so check Instagram early in the day. I will post the link to each activity here on this blog landing page as we go so you can follow along if you don't have Instagram. If you decide to try out any of the activities, direct message me a photo or tag it or use the hashtag #kidapprovedchristmas. I want to see what you are up to! Click on the hashtag #kidapprovedchristmas if you need any extra fun Christmas ideas as well. I can't wait to get started today! Make sure you are following me at @kristinatoddlerapproved on Instagram if you are going to join in! Let's make this an awesome holiday season! Check out my 10 favorite Christmas activities for toddlers HERE if you need more activity ideas. I also love pinning Christmas ideas and Christmas treats on Pinterest. Thanks so much for doing this again this year! I don't have Instagram so I can't post pictures along with you there, but my 2-year-old son loved making the spin art wreaths yesterday (he even asked his dad and I to make one too!) and I've got the materials ready for the snowball launcher to keep us busy after nap. We really appreciate all of your hard work! Love this article! I got fabulous activities for my little kid on this Christmas. I can try few of them on this weekend. Thanks for sharing!